The new Maryland House rest stop is beginning to look cheerier now that we actually seem to have a spring in the Northeast. The new facility has a lot to be said for it (as it should for $30 million). This is reputedly the busiest rest stop in the entire US, so it’s important to get it right. · The traffic pattern needs work. Although it may have made sense on paper, I found myself having a difficult time finding the pathway back to I-95. Lots of possibilities for conflicts. 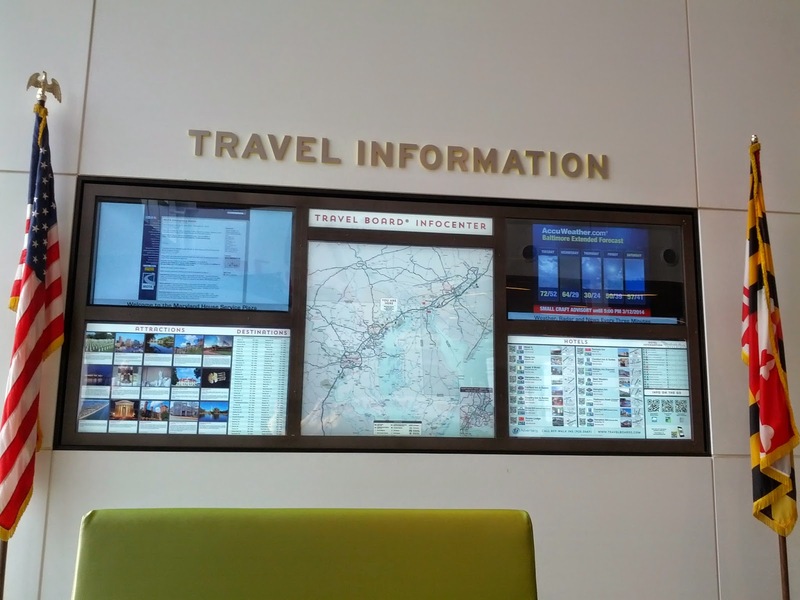 · The traffic info panel is good, but still not doing what I think technology can do for us. We need to get to real multimedia, interactive displays with more information and more razz-ma-tazz. · Why is the tourist information area so much smaller than the old one was? 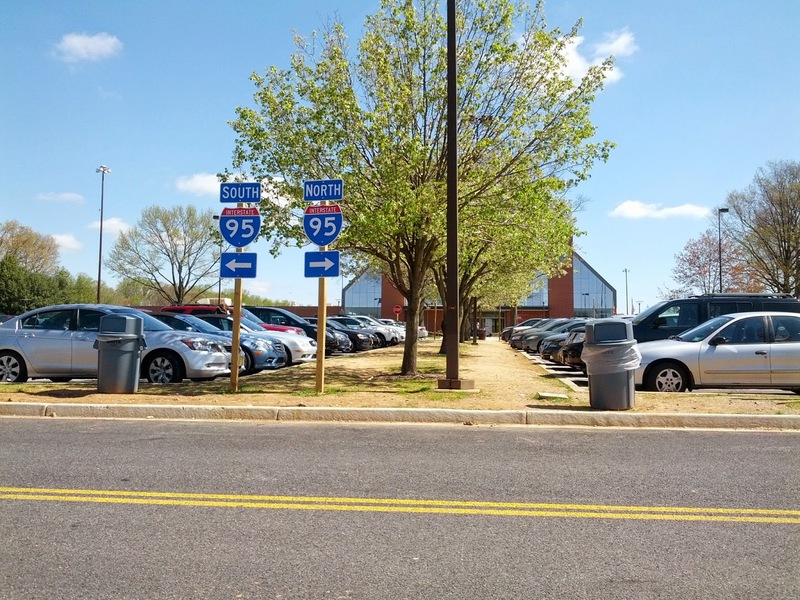 · Interesting to see that the landscaped strip leading to the front door (which looks like it was designed just as a partition in the parking field) has been converted by the traveling public into a green pedestrian pathway! All in all, Maryland has done a good job with the new facility. I just miss the old Maryland House, a rather picturesque and sentimental landmark for many of us for many years. One Wisconsin highway “boondoggle” stopped! Congrats to WISPIRG for leading the way in stopping one extraordinarily bad highway project in Wisconsin (see Streetsblog USA story here). WisDOT has dropped plans to widen State Highway 38, a winding, mostly rural, two-lane road with no apparent need for major improvements. Although WisDOT says the project was stopped due to local opposition, I believe the fact that WISPIRG highlighted the Route 38 project in its 2011 “Building Boondoggles” report (available here) was really the beginning of the end. Having provided research for WISPIRG on the “Boondoggles” report, I have to say this project is one of the least meritorious I have ever come across. It’s a mystery why it progressed so far, and a good thing that it has ground to a halt. Let’s hope this is the beginning of better choice making in Wisconsin, which has plenty of real transportation challenges to cope with. One supposes that it’s this news that has various fossil fuel corporations and Flat Earth politicians looking for ways to penalize users of renewable energy. Although the UN report mentions the transportation sector only tangentially, there is an important connection. Electrifying transportation makes sense for a lot of reasons. But to get the maximum impact on greenhouse gas emissions, that electrification needs to be based increasingly on no-carbon/low-carbon energy generation. Let’s look forward to an even better Earth Day in 2015! After years of prep work New Jersey’s Pulaski Skyway is closed for 2 years for major rehab work, costing upwards of $1 billion. Having been in at the beginning of this project I’m happy to see it move forward, though it’s a complicated story. After spending that $1 billion (and actually a lot more than that, when you add in all the extraordinary maintenance costs over the past several years) we will have a 3 ½-mile long structure connecting Newark with the Holland Tunnel, but not located where you would put it today – and since it traverses miles of wetlands it would be problematic to build it at all today. In fact, if you were given $1 billion and told you could spend it anywhere in New Jersey to improve mobility, you probably wouldn’t spend it here. The Pulaski Skyway is a piece of legacy infrastructure that’s too important not to save, too expensive to tear down, doesn’t generate enough traffic to impose tolls, and can’t handle trucks. Are there lessons to be drawn from the Pulaski Skyway project? I would say two: First, we have some major pieces of legacy transportation infrastructure that are going to require some tough decision making over the next several years. Second, don’t try to draw too many lessons from big pieces that have so many unique features. Hong Kong – Multimodal and Modern! Thanks to my friend and colleague Carlos Rodrigues (www.rodriguesurbandesign.com) for these photos of multimodal public transportation in Hong Kong - airport train, subway, double-decker trolley, ferry and urban people mover! Can we have some more of these here too, please? So Arlington’s “streetcar election” resulted in the streetcar advocate losing (my background here, Washington Post story here). As I said before, it’s easy to read too much into special elections. The WaPo story notes that turnout was only 16%. And although some of the voters interviewed referred to the Columbia Pike Streetcar issue, I doubt that anyone did any sort of exit polling to determine the actual leverage this issue had. 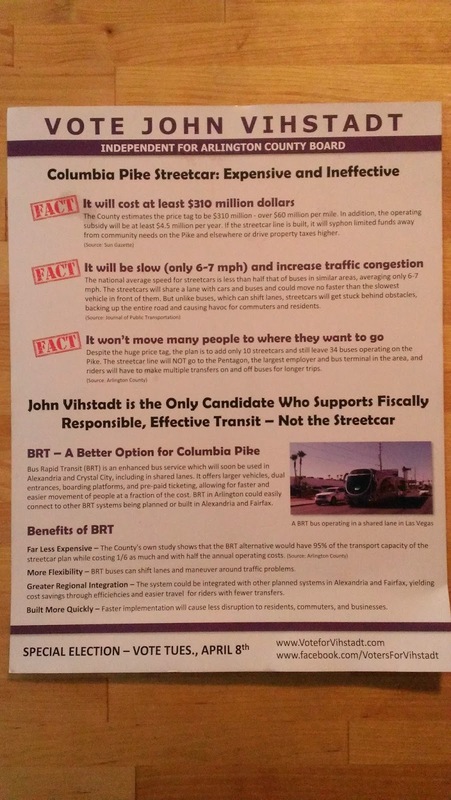 Also, transit advocates can take some comfort in the fact that the anti-streetcar candidate did not oppose all transit improvements in this campaign: his basic argument was that bus rapid transit is the best solution in the corridor. Still – there is no blinking at the fact that the streetcar project sustained a setback. For many of us, the virtues of a walkable/bikeable, transit-oriented-development corridor, based on a transportation spine using a modern, electrified public transportation system, seem to be obvious. And, indeed, Arlington is a showcase for TOD planning and development, with the Orange Line communities sustaining a high quality of life in bustling, sustainable, mixed-use settings. Nevertheless, streetcar advocates need to work harder to get their message across. And despite the potential benefits of the Columbia Pike streetcar, both for the community and for TOD planning and development nationally, Arlington has gotten very little support from the state and federal governments. Much more needs to be done at those levels. FTA and Virginia DOT, I’m looking at you. Since a special election for a county board seat usually attracts only a tiny voter turnout, it may be possible to read too much into the outcome. Nevertheless it is an election with a clear choice and may have significant consequences. Let’s see what happens. Will improved Interstates force people into bypassing their Big Macs? The point of the story appears to be that there is a debate of sorts between people who advocate tolling as a solution to highway funding and those who object for various reasons (fast food vendors among others). This is true as far as it goes, but misses several points that I think are important. First of all, the Interstate system has big needs, but it is only one segment of a transportation network with a lot of big needs. As a practical matter, tolling works well in some places, but would be difficult to apply to many segments of the Interstate system – especially metropolitan areas, where most of the traffic is. Increased use of tolling – and higher tolls – would definitely raise some money, but nowhere near enough to offset the decline in the Highway Trust Fund. More importantly, the story pretty much avoids what I regard as the central question: why don’t we just raise the gas tax to pay for repairs to the Interstate system, repairs to other highways and transit systems, and beginning to build a real 21st century transportation network? As I have said before, avoiding using the gas tax to pay for transportation needs is like avoiding the hammer in front of you when you have a nail to drive, and instead searching around the room for wastebaskets, heavy books, or staplers to use. The story does quote former Governor Rendell as saying we should look at more tolling because “there is no appetite to increase the gas tax.” And one anti-tolling advocate is cited as arguing for an increased gas tax. But why is there no appetite for the gas tax? No one likes raising taxes, but for many years there was bipartisan support in Congress for bumping up the gas tax when it was needed. The missing piece of the story is the rising influence of anti-tax, Tea Party conservatives, who have had a corrosive effect on federal investment in anything, including transportation. The good news is that we have seen a rebirth of bipartisan transportation funding efforts at the state level. Republican legislators in Pennsylvania and Virginia probably didn’t have an “appetite” for raising the gas tax either, but they voted for it. Hopefully we will begin to have a real and constructive debate on these issues – and hopefully the New York Times will do a better job of covering it.